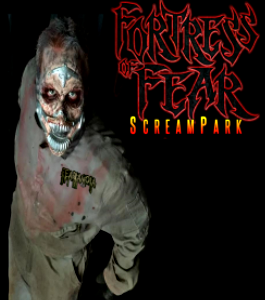 Fortress of Fear Screampark features TOP RATED Haunted Houses in Ohio! Screaming is just the beginning...Rated TOP TEN by DAFE for favorite FALL/OCTOBER Seasonal Dark Attraction/Event. Located in the forgotten town of Garrettsville, Ohio, these popular Haunted Attractions will scare you beyond your limits. Encounter room after room of sheer fear! 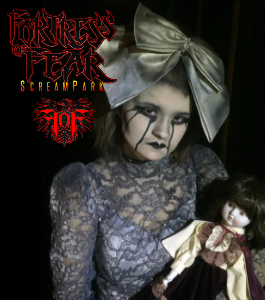 CLAUSTROPHOBICS BEWARE as you navigate your way amongst the souls within the dark and narrow halls inside the FORTRESS OF FEAR, a 17th century themed castle where the living abandoned long ago but their spirits remain. Endure a sensory pandemic as you try to breakaway from the contaminated warehouse employees of FEARANOIA who want YOU to be their next associate! Plus, face your fears as you try to escape FEARGOTTEN, high-intensity Escape Rooms regulated by the Authoritarian Regime! Open weekends throughout October with Special Events on FRIDAY THE 13TH and HALLOWEEN! 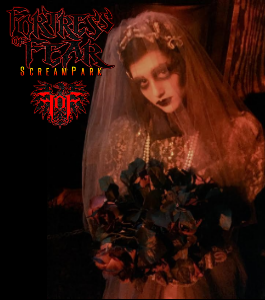 Visit http://www.fortressoffear.com for complete information including special pricing for larger groups/parties (by reservation only). We take pride in your screams! Join us...if you dare! We are dying to meet you! Tickets may be purchased online or at the ticket booth. 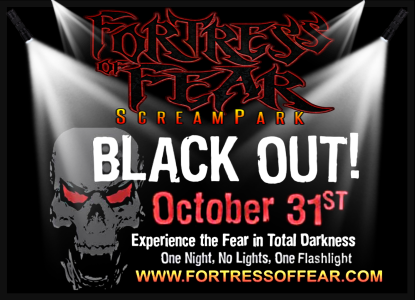 On HALLOWEEN, experience the Fortress of Fear ScreamPark in TOTAL DARKNESS! This Special BLACK-OUT Event takes place 1 night, no lights, and only 1 flashlight per group! A bonus night for only the BOLD. Experience ALL attractions in Total Darkness with TOUCHES of fear all around you. Waivers must be signed before entry and may be downloaded from the website. Parental signature is required for those under 18 years of age. ~ When: Tuesday, October 31st ~ Time: 7pm-10pm ~ Price: $25 per person ~ Includes: ALL Attractions and 1 Flashlight per Group ~ Non-Refundable and Non-Transferable ~ Valid only for the current season Will YOU find your way out? We'll SEE about that! Have a group and want a discount? Group Rates are available for 20 or more people and must be arranged IN ADVANCE by emailing info@jmd-entertainment.com. Mental note...the more, the scarier! 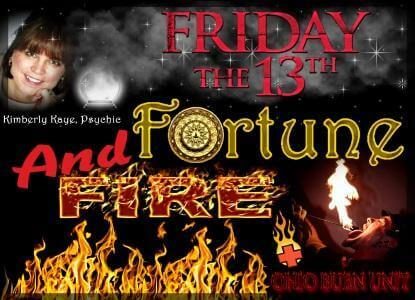 Buy your tickets online at www.fortressoffear.com and by-pass the ticket booth.